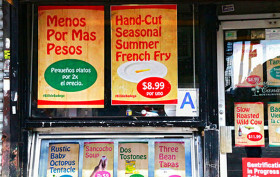 Gentrification Sale: Get a Single Hand-Cut Summer French Fry for Just $8.99! A row of mom and pops located along a stretch between 162nd and 163rd streets got a Williamsburg-worthy facelift on Monday as Brooklyn locals Doug Cameron and Tommy Noonan plastered storefronts with scathingly sardonic signage pointing to the area’s demise. The campaign, first reported on by Vanishing NY, was created in response to the ousting of several of the block’s 30-plus-year-old businesses by a new landlord in order to make way for commercial tenants willing to pay higher rents.